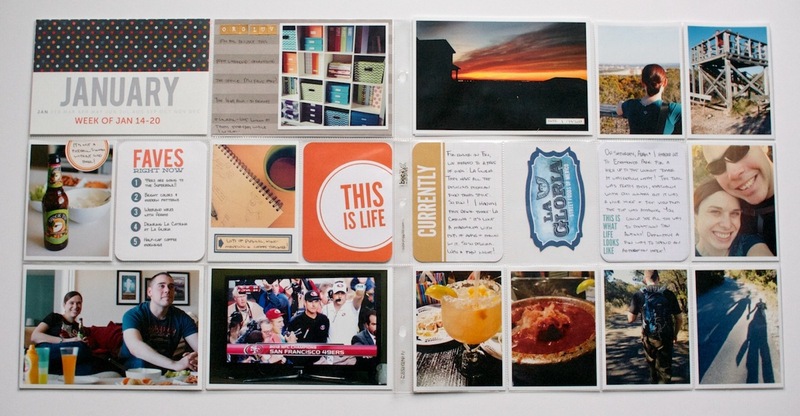 Welcome to Project Life 2013, Weeks 2-4. If you’re thinking you somehow missed Week 1, well you haven’t. Ha! The week of Dec 31st to Jan 7th, we were still out in California (we flew home on the 4th) so we did a TON of stuff in those days. And since I chose to wait to start my album until my Seafoam kit arrived mid-month, I decided to start with the most recent week and work my way back. So I will share Week 1 once it’s finished, hopefully by my next update. But I wanted to share what I have finished today. Here’s a look at Week 2 spread. 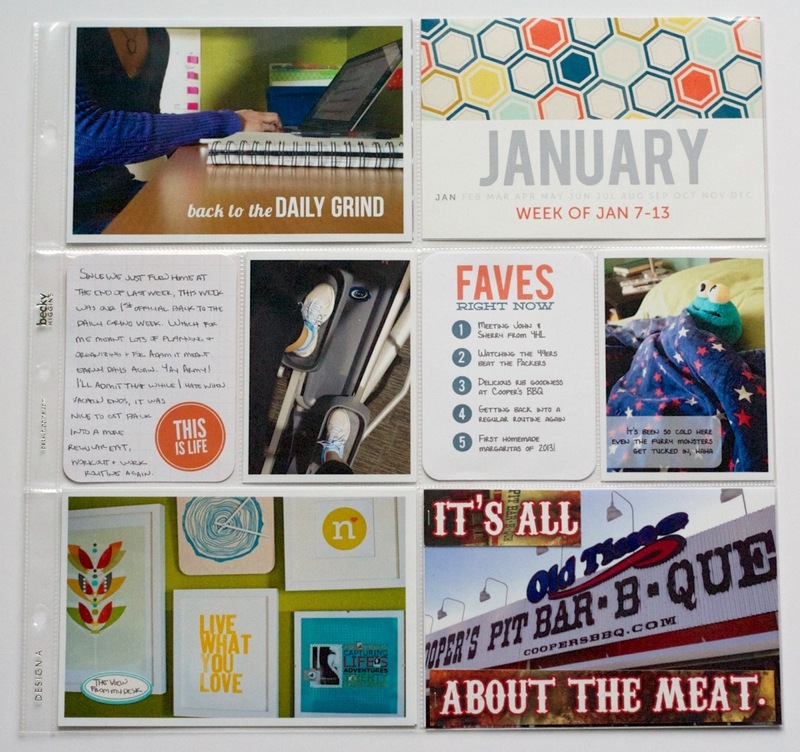 I mentioned in my Creative Adventure: Project Life post that I’m mixing Design A page protectors with a variety of other designs. You can see that in action here – the left page is Design D, right page is Design A. 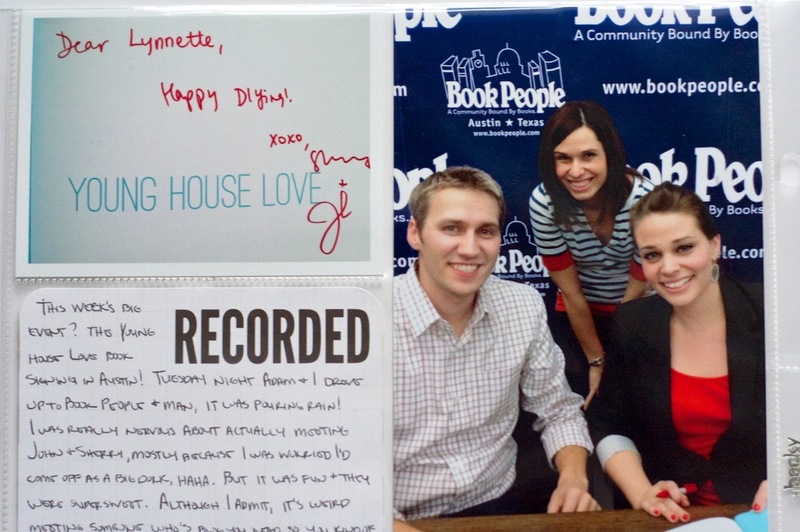 Why yes, that is me meeting John & Sherry from Young House Love (points to Jen for catching this in my peek last week!). They came to Book People in Austin for a signing so Adam and I went (even though he had no idea who they were, haha). I admit I was really nervous – what exactly do you say to someone when you”know” all about them from their blog but they have no idea who you are? LOL! But they were super sweet though and just as fun in person as in their blog. And I have to say major points to Book People because they ran that signing like a well-oiled machine. After the signing Adam and I headed to one of our fave Austin eateries Hopdoddy Burger Bar. Even though it was almost 9 on a weekday when we got there, there was still a line! I know, the Faves are hitting Project Life, surprise, surprise right? I do love my faves, haha. My plan is to use papers/colors from the same kit for each month so all the titles, Faves cards and any accents I make will all match. I think it’ll add some nice continuity to the album since the colors in the photos are all over the place. 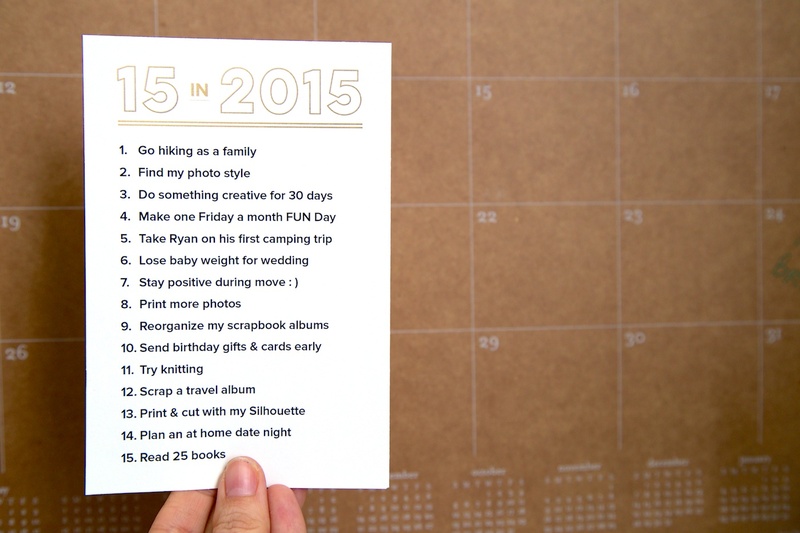 For January I’m using Paislee Press’ More + Less kit. You can see how the same blue & tangerine color tie the title card and Faves card together throughout all the spreads. Orange “This is Life” card is from the Seafoam core kit. Everything else is random scrap stuff I had lying around. This week was the first time I tried adding in Instagram square photos – I have to say, I’m liking them. And can we just pause for a moment and say, WAHOOOOO 49ERS!! SUPERBOWL HERE WE COME! WAY stressful game to watch, haha, but we were a wee bit excited about how it turned out. It’s hard to tell in the photo but I’m totally wearing my SF Giants World Series Champions shirt in the photo – figured maybe some of the SF Giants luck might rub off on them, hehe. Another look at this week’s Faves card. 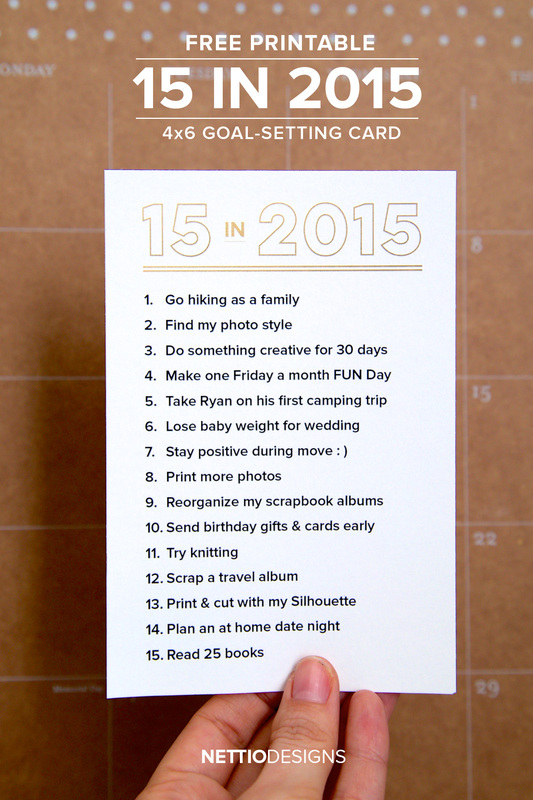 I’m totally not stressing about these – I just write out 5 quick items and print them directly onto one of the blank 3×4 Project Life cards. Right side of Week 3. This week is a mix of Design A & Design F page protectors. Saturday we went on a hike here in San Antonio so the entire right side of the page is devoted to photos from that. 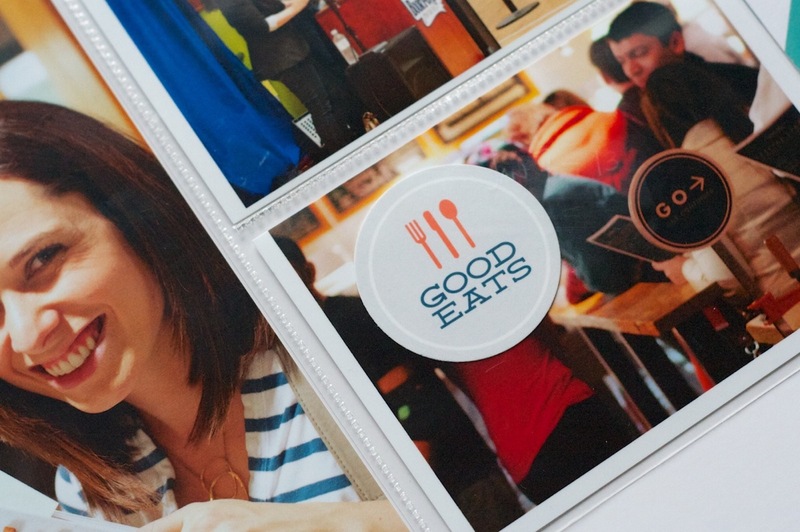 We went out to dinner on Friday so I included one of their cool business cards on it. Since it was too small for the pocket, I just stapled it directly to the page protector using my Tim Holtz Tiny Attacher. My Week 4 spread – a mix of Design F & Design A page protectors. I’m really thinking Design F may be my fave – I love filling all the little pockets. Left side of Week 4. Pretty simple, movie tickets, back of the restaurant business card. 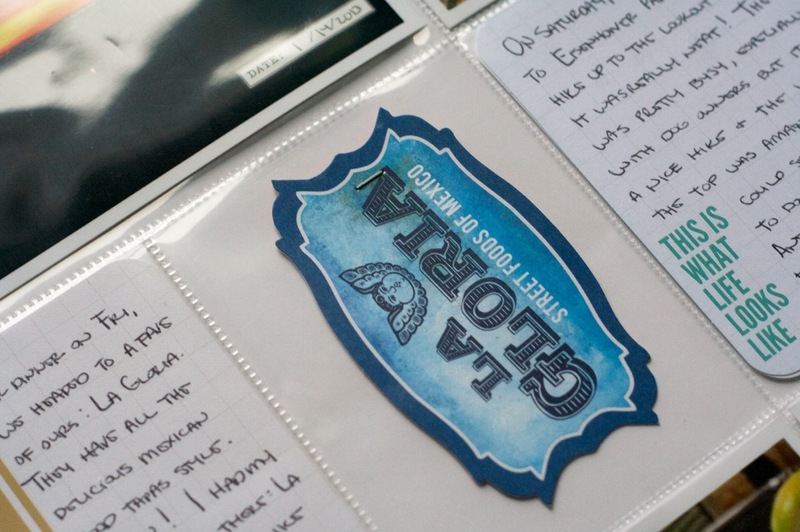 The mini photo book in the top right photo is an extra early sneak peek of my product for this weekend. The Target “window shopping” photos were a total happy accident. I went to Target last night to get some frames and since I needed a bunch I knew I couldn’t buy anything else. So I snapped photos with my iPhone of a bunch of stuff I liked so I could “try” them out in our house instead. 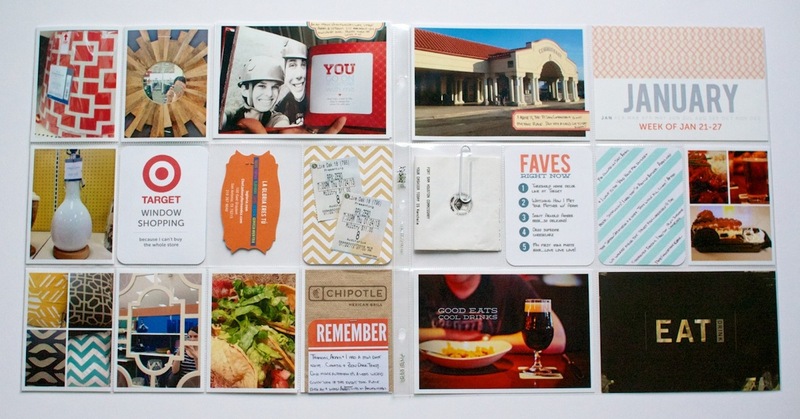 But when I saw them all together I thought they made for a fun addition to Project Life. Just imagine if you had something like this from the 70s or 80s. It’d be so fun! 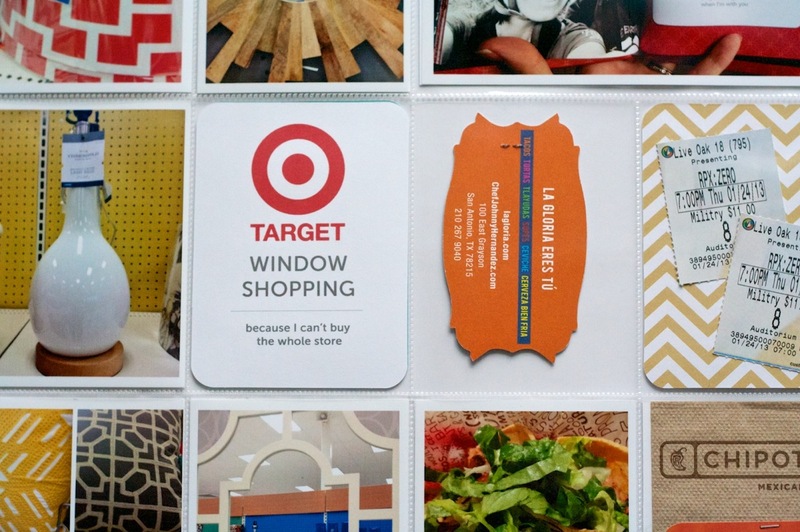 For the Target card, I just googled for a logo image that had enough pixels that’d print nicely and then added some text in Photoshop and printed it onto a blank 3×4 Project Life card. 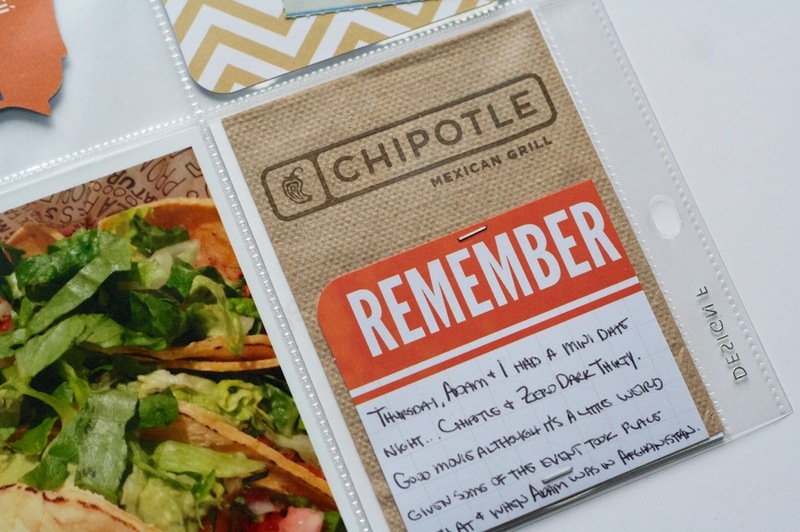 Before we went to the movies we had dinner at Chipotle so I saved one of the napkins to include and then trimmed down one of the Seafoam 3×4 cards for my journaling. We went & saw Zero Dark Thirty which I have to say, we really enjoyed. But it was a wee bit weird considering some of the places and events happened when & where Adam was in Afghanistan. So he kept saying things like, “yeah that’s totally not what that FOB is actually called” or “it doesn’t really look like that at all,” haha. Right side of Week 4. 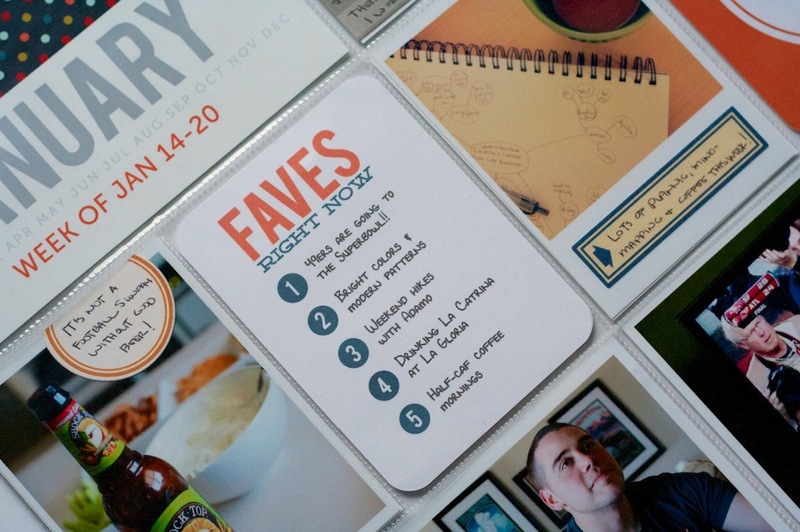 The Eat|Drink card came from a brochure from the Yard House where we ate dinner on Saturday. Diagonal journal card from the Seafoam kit. This week’s Faves card. Since we went to the commissary on Saturday (the grocery store on the military base) I included our receipt with a paperclip to hold it in. Well that’s it for Project Life 2013: Week’s 2-4! LOVE the mix of page protectors. So very glad I decided to go that route. 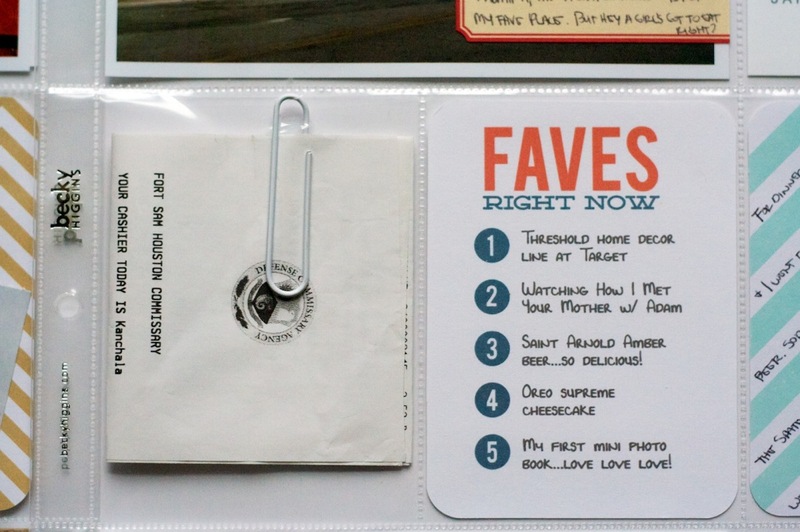 Faves cards – always a winner in my book. Loving the repeating title cards & colors too. I was really worried about having enough content for each week, especially since some weeks I felt like I didn’t really take many photos during the week. But I’ve had to cut more than I’ve had to fill so far. That’s the hardest part for me – I want to include it all! Definitely need to streamline my process a bit but I think once I get in a rhythm it’ll be good. Not getting behind is going to be key though. Am already coming up with new product ideas, simply because they’re things I want to use. Love that. LOVE LOVE LOVE-ing all the little stories captured so far in this album. They’re exactly the reason I wanted to do this album this year. SO glad that I took the plunge. I’m loving the completed pages even more than I thought I would. Clearly there’s a whole lot of Project Life lovin’ going on here, hehe. And to share a little bit of the love, I’ve got a little freebie for ya! 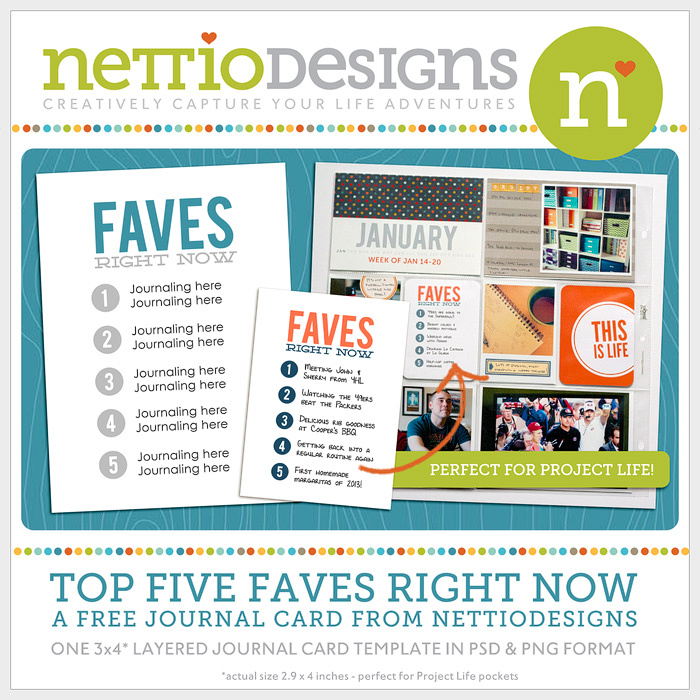 Use the link below to download your own FREE copy of my Faves 3×4 Journal Card. All I ask in exchange is if you like it, pin it, share it & let your friends know they can find it right here at Nettio Designs. 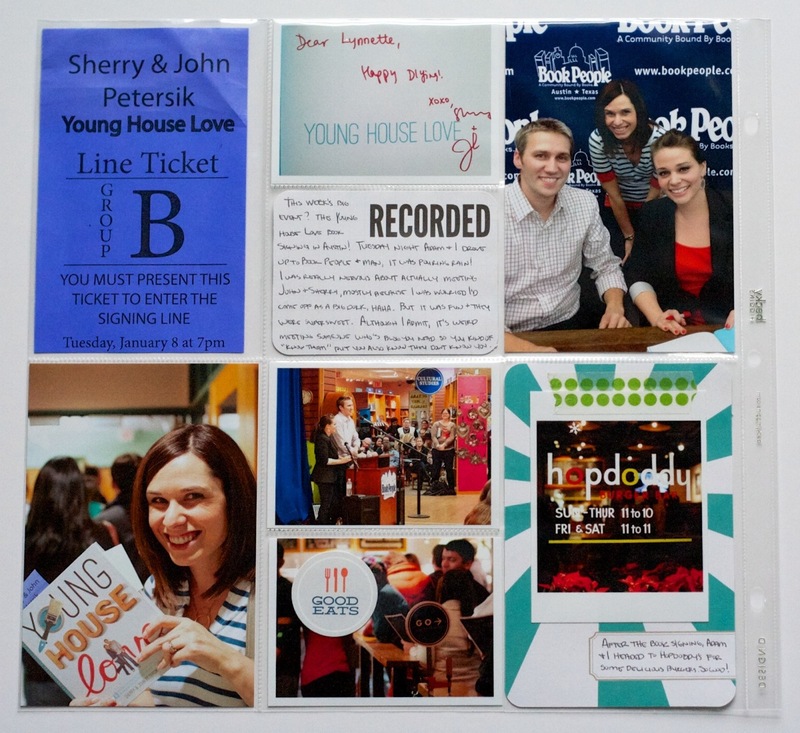 Since the card is designed for Project Life, the actual size is a tiny bit smaller than 3×4 inches – it’s about 2.9×4 inches. 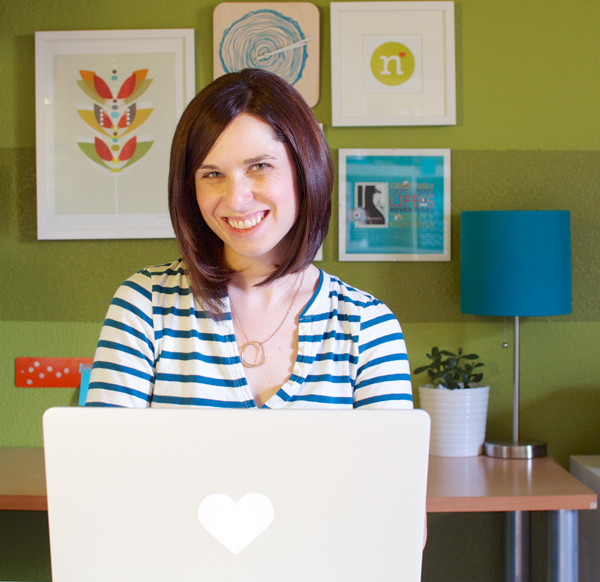 File includes a layered, customizable PSD file and a solid colored PNG file. What about you? 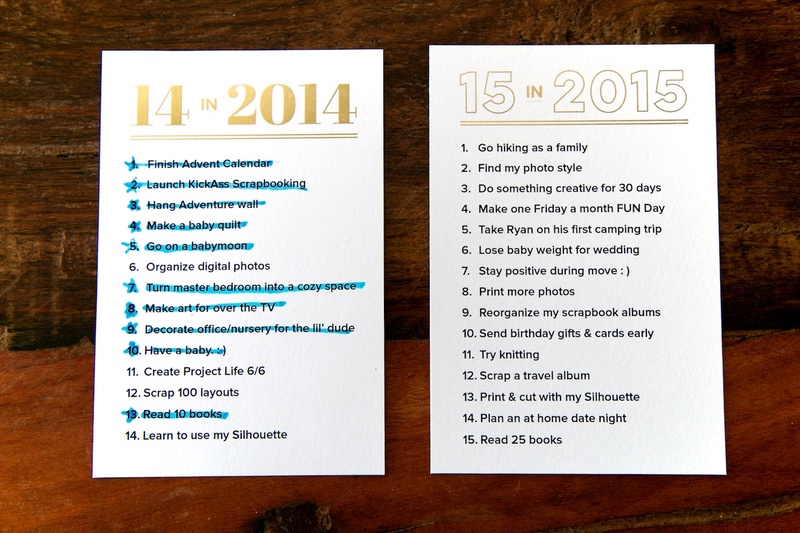 Are you doing Project Life this year? If you are, how are things going for you so far? We’re almost a full month in, can you believe it?! 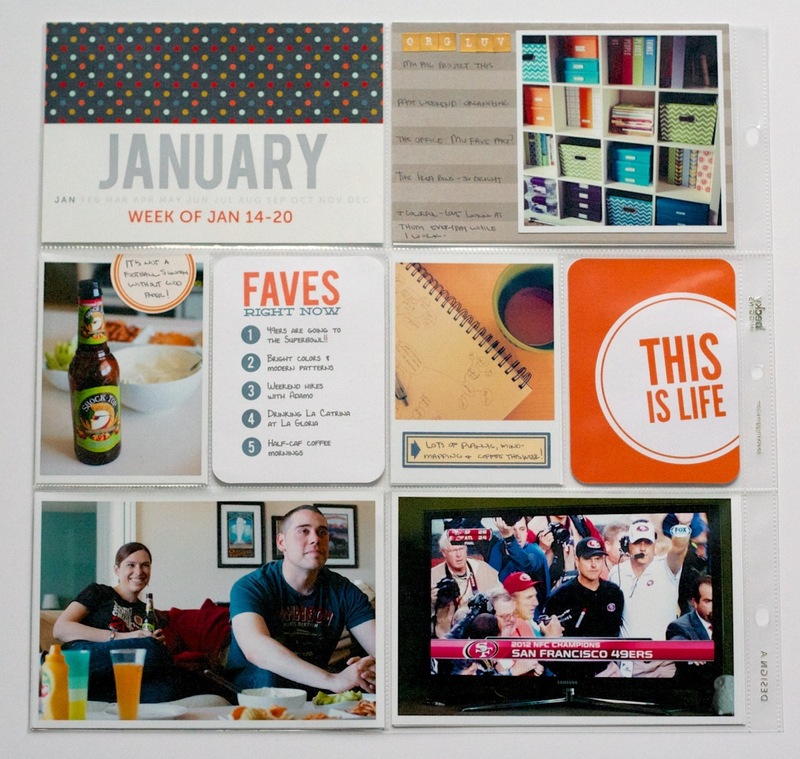 Project Life is a memory-keeping system created by Becky Higgins. New to Project Life? 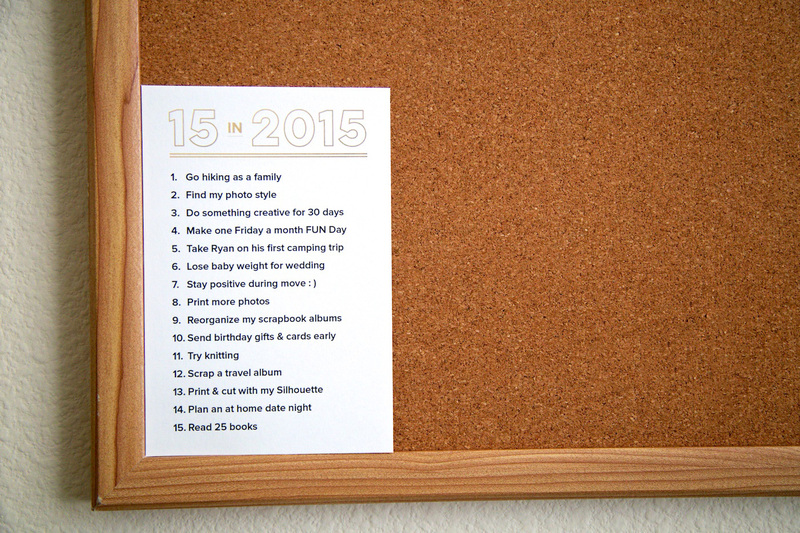 Learn more here & find all my Project Life posts here. 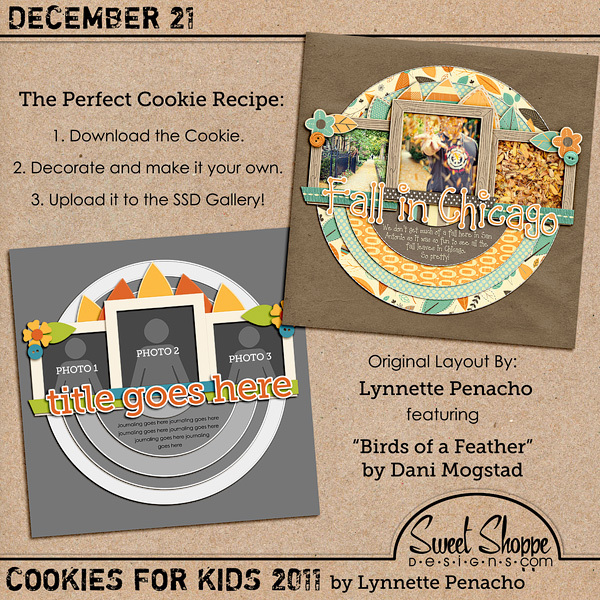 Free Cookies 4 Kids Template Available TODAY Only at Sweet Shoppe Designs! Today is my Cookies 4 Kids template day over at the Sweet Shoppe which means for TODAY only you can download a FREE template from me! The download link will only be active on December 21st so if you want to pick it up, make sure you stop by the Sweet Shoppe forums today! Happy Holidays & Happy Scrapping! Happy December everyone! Welcome to one of my most favorite months of the year! 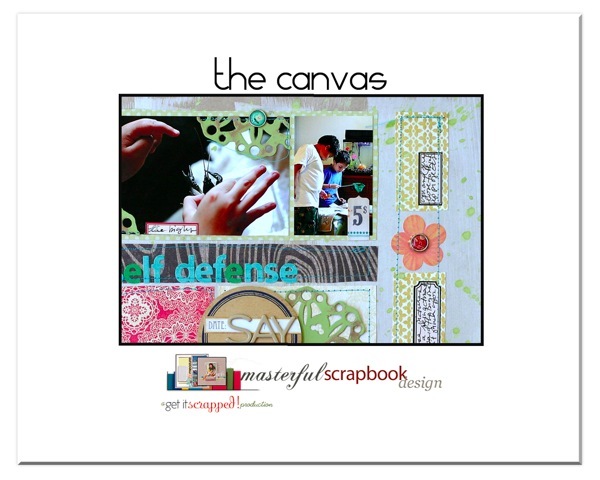 This month I’m guest teaching over at Masterful Scrapbook Design along with 4 other AMAZINGLY talented scrapbookers: Anna Aspnes, Emily Pitts, Doris Sander, and Dina Wakley. 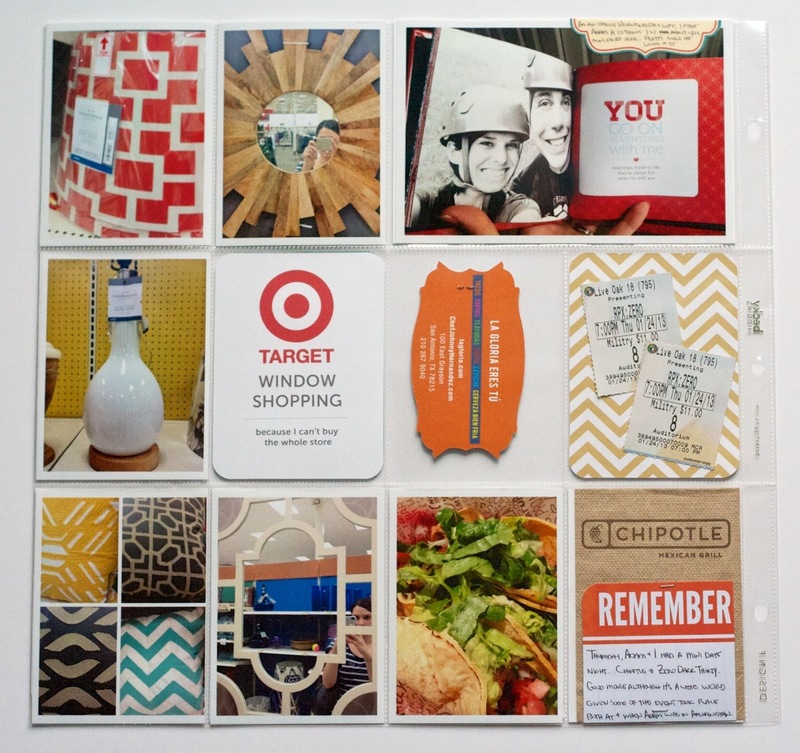 This month we’re talking all about the scrapbook page canvas, beginning with the options you have for its base, moving onto the first layers and foundations you place upon on it, and delving into the many ways you can fill a canvas for striking looks. I had a totally fun time putting together my assignments for this month’s seminar so I really hope you stop by and check it out. 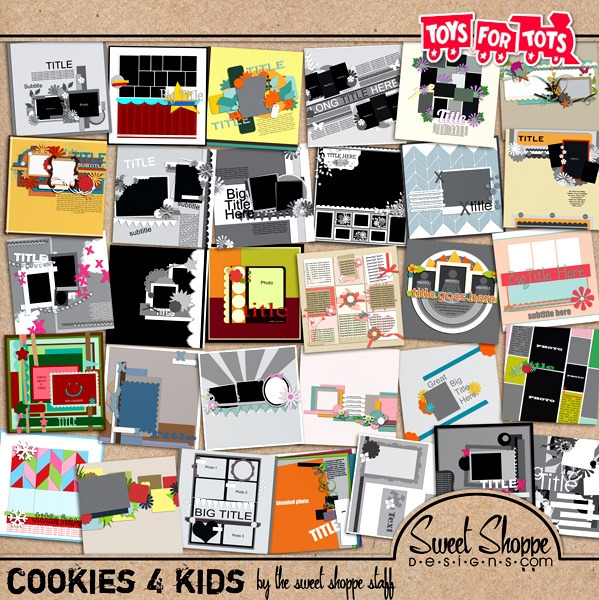 The always popular Cookies 4 Kids template giveaway is BACK at Sweet Shoppe Designs! If you’re new to Cookies 4 Kids, each day in December, in the Sweet Shoppe Designs forums, a free template from one member of our team will be available to download for that day only. My free template day won’t be coming around until later this month, but in the meantime, if you want to make sure you dont miss a single day, you can purchase the entire set of templates in advance with 100% of the proceeds being donated to Toys for Tots! It’s a total win-win. 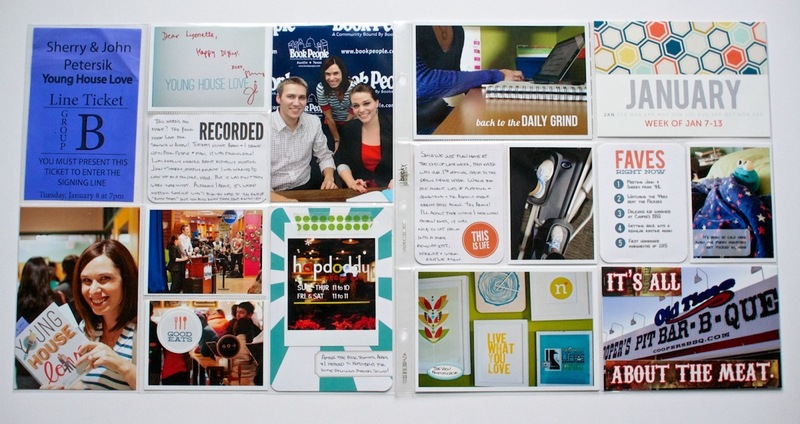 You can get some amazing templates from our team AND help out an amazing cause at the same time. The advance template set is only available until December 15th so make sure you pop on over to the Sweet Shoppe and check them out. 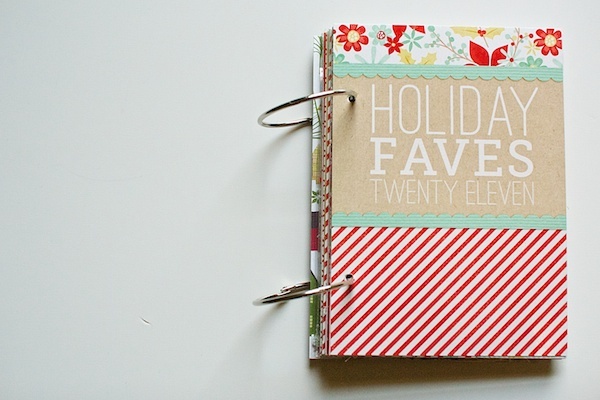 And of course here at NettioDesigns, I’ll be sharing my progress on my Holiday Faves Mini Album all month long. I have been waiting for this project literally ALL year long so I’m so excited it’s finally time to get scrapping. It’s like Christmas has come 25 days early! 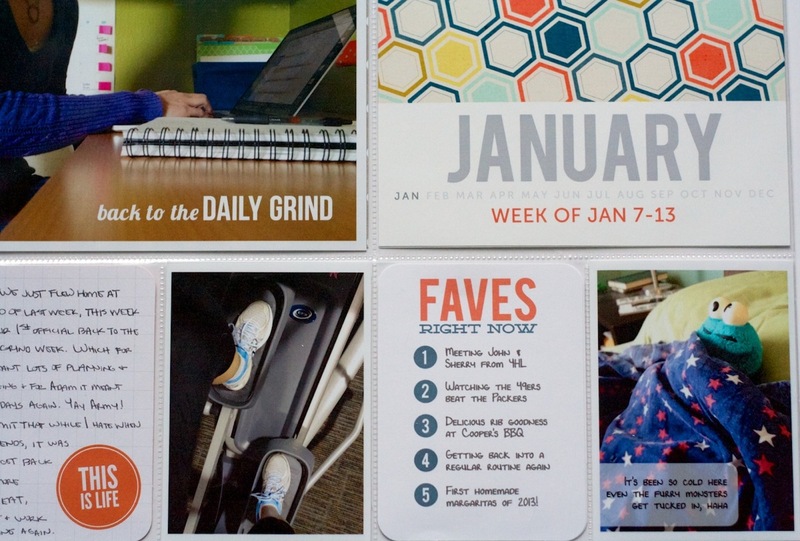 If you’re looking for a little December Daily-style pep talk, be sure to check out these great tips from Ali Edwards along with this post full of awesome ideas to include in your album. 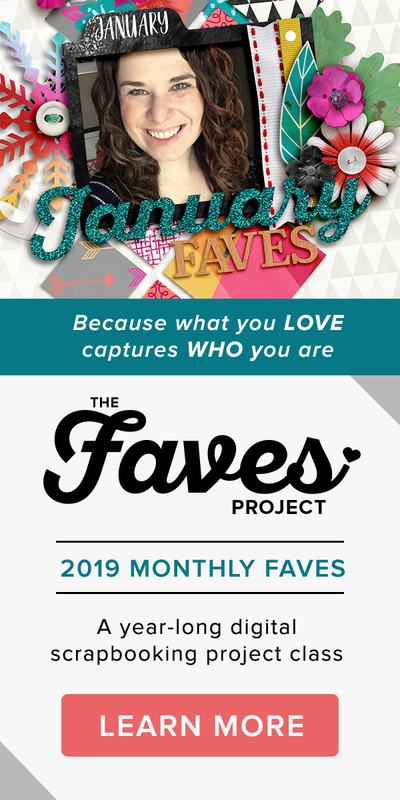 AND if you’re in need of even more Holiday Album inspiration and ideas, my super amazing Creative Team and I (or the NettioDesigns Team Awesome as I call them, hehe) have teamed up to bring you this PDF FULL of holiday-themed prompts to get you started documenting your holidays. 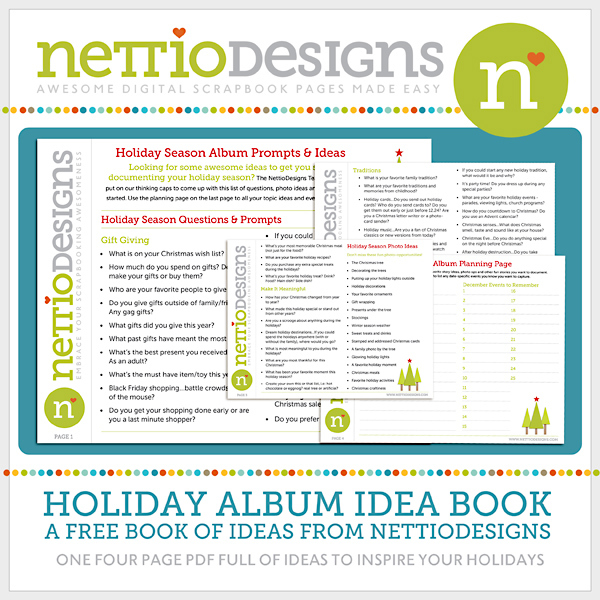 Just click the Download button below to get your very own copy of the NettioDesigns Holiday Album Idea Book. Included in the download is a 4-page PDF full of journaling prompts, photo ideas and even a planning page you can use to jot down your topic ideas and December events. 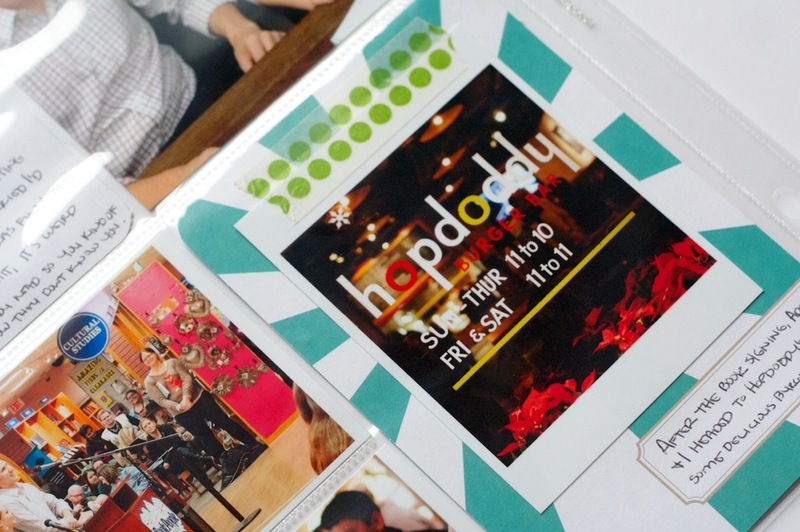 And with that, I’m off to work on my Holiday Faves Mini Album pages…Happy December scrapbooking! 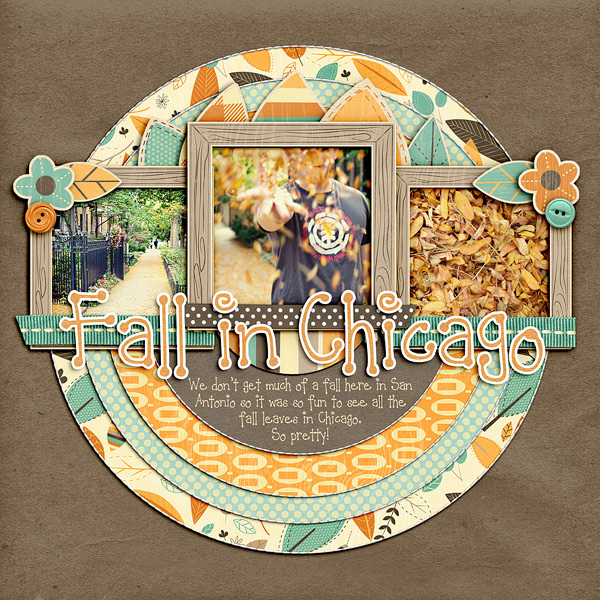 For the Sugarbabe September Portfolio challenge over at Sweet Shoppe Designs, I was tasked with creating a digital scrapbooking layout based on inspiration I had saved/favorited/pinned. Since I have an love obsession with Pinterest, I turned to my scrapbooking pin board and selected this super awesome layout by one of my absolute favorite paper scrapbookers, Kelly Purkey. She’s a girl after my own paper-lovin’ heart with the way she rocks patterned paper! 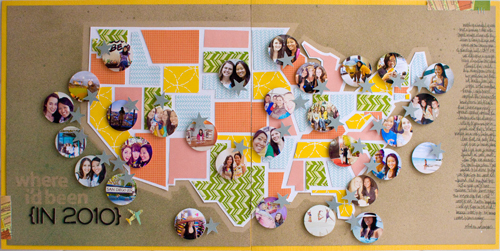 Specifically what inspired me about this layout was the graphic shapes she gave to the states and her bold use of patterned paper against the kraft background (no surprise there, haha). I also loved all her little circle photos representing all the places she had visited. 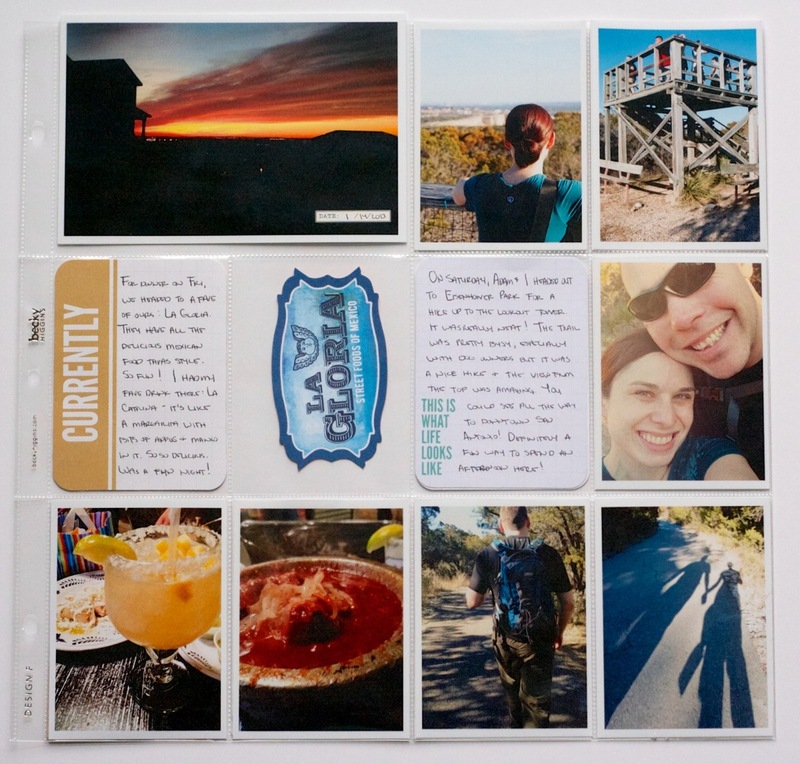 Now while I love to travel, I certainly don’t travel as much as she does, so I decided instead to theme my layout around all the places Adam and I have lived so far. Since we have yet to live on the East Coast (it’s on our short list of places to go next since it’s the one US time zone we haven’t lived in yet, haha), I decided to simplify my layout and do a single page featuring the Western half of the United States. Since I posted this layout over in the Sweet Shoppe gallery earlier this month, I’ve gotten a some questions asking how I put this layout together. 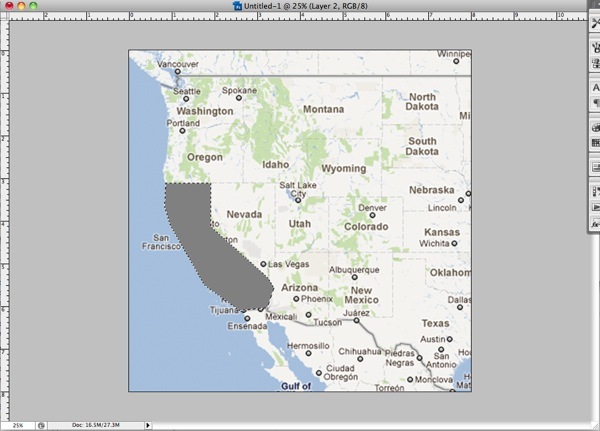 Kelly has an awesome tutorial over on her blog showing how she designed her map using paper, but since my layout is 100% digital, I’ve whipped up a little tutorial to show you how you can get this same look using Photoshop. A little note: this tutorial was written based on Photoshop CS3 so it should work in other versions of Photoshop, but I haven’t tried it using Photoshop Elements. As always, there are a million different ways to do the same thing in Photoshop so I’m just sharing what worked for me. Step 1: The first thing you need to is find a map of your desired location. I took a screenshot from Google Maps for my map but any map image will do as long as it has the outlines of the states/countries on it. 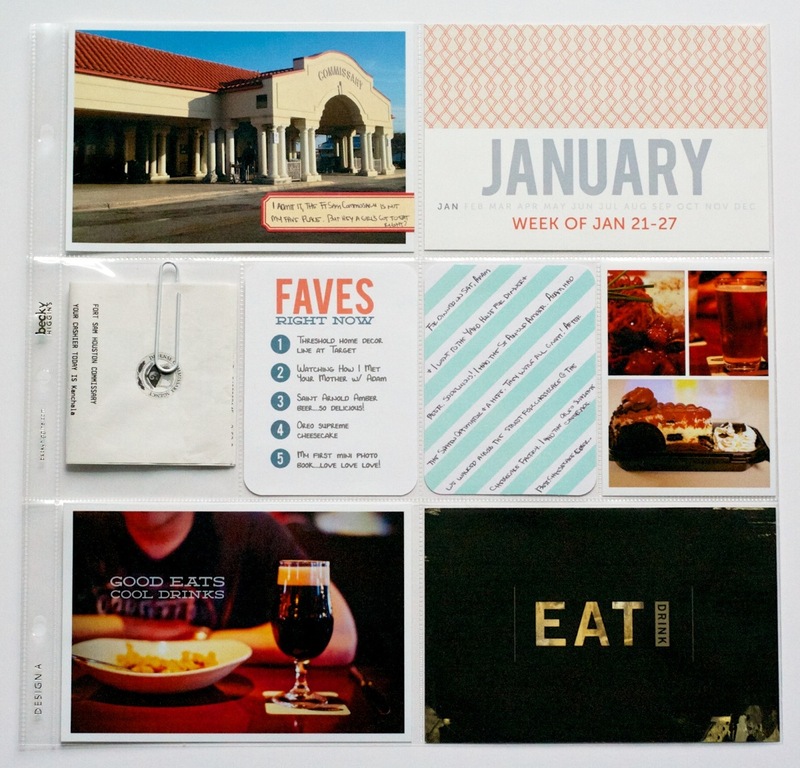 Once you have your map, you need to drag it onto your scrapbooking canvas and resize it to the size you want your final map to be. I made my map fill the majority of the page. 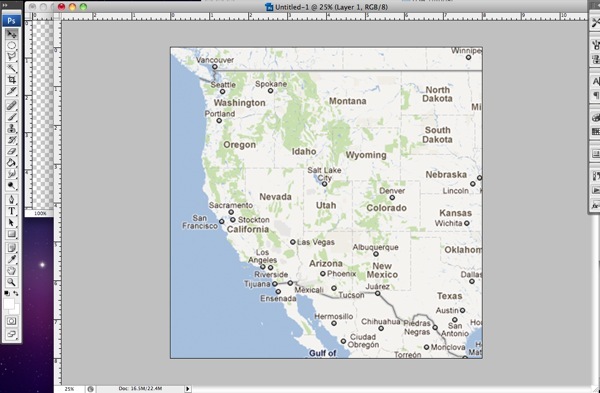 Don’t worry if your map image ends up pixelated, it won’t show in your final layout. Step 2: Next, you want to grab your Polygonal Lasso Tool. 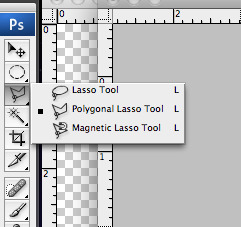 You’ll find it under the normal Lasso tool – it’s the lasso with the weird angles on it. 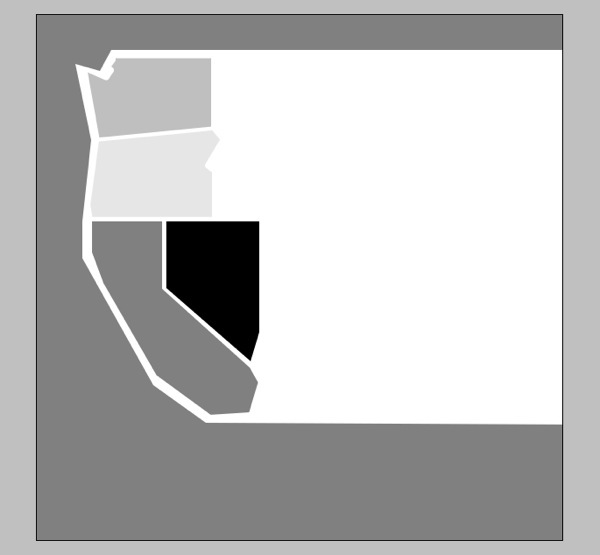 Step 3: Now we’re going to use the Polygonal Lasso Tool to draw a shape around each state using the lines on the map as a guide. Don’t worry about all the little detailed areas, we’re going for the angular look of the shapes in Kelly’s inspiration layout so we want to keep the shape simple. If you’ve never used the Polygonal Lasso Tool before, it’s really easy. 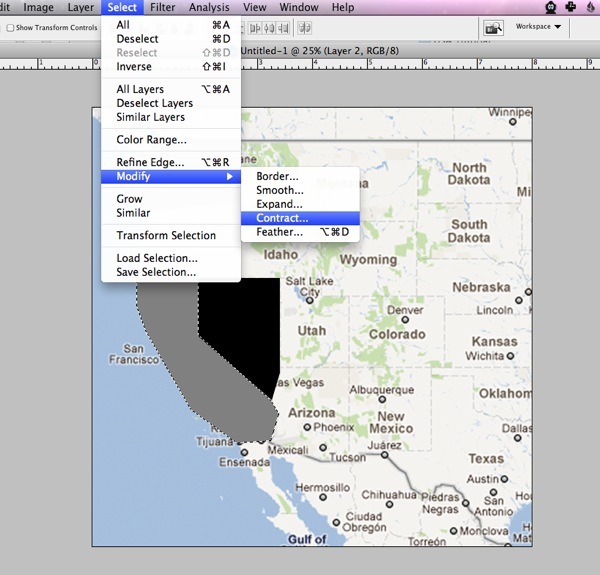 You just point and click where you want to add a corner on your shape. If you want to draw an exact straight line between two points, hold down the Shift key and it will give you either a 90 or 45 degree angled line. To close off your shape, bring your arrow back to your starting point and move it around until you see a small circle. Then click to close the shape. 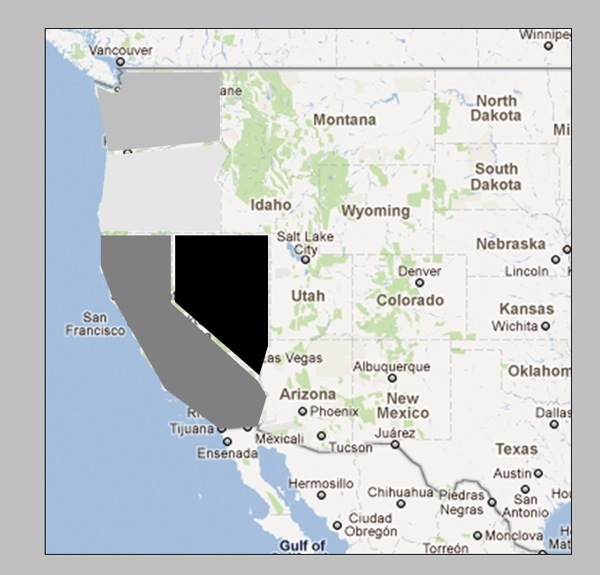 Step 6: Now you want to deselect your shape (Cmd+D on a Mac, Ctrl+D on a PC) and repeat steps 1-5 for ALL of the states or countries on your map. For my original layout this meant the entire Western half of the US but for the sake of this tutorial, I’m going to just do four states. Here’s what your map should look like once you’ve completed all your shapes. Notice at this point there is no space between the shapes – they all fit together nice and tight. That’s what you want. Step 7: Our next step is going to be to add space between the shapes so our mat layer will show through. (On my layout the mat is kraft, on Kelly’s layout the mat is white.) To do this we’re going to contract each shape down by the same exact amount. 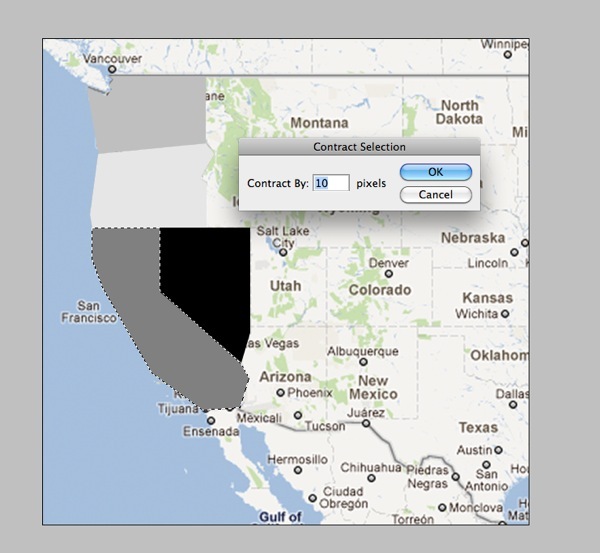 Step 8: We’re going to contract each shape by 10 pixels so enter a 10 into the dialog box and click ok. Step 11: Now you’re going to repeat Steps 7-10 for all the shapes on your map. 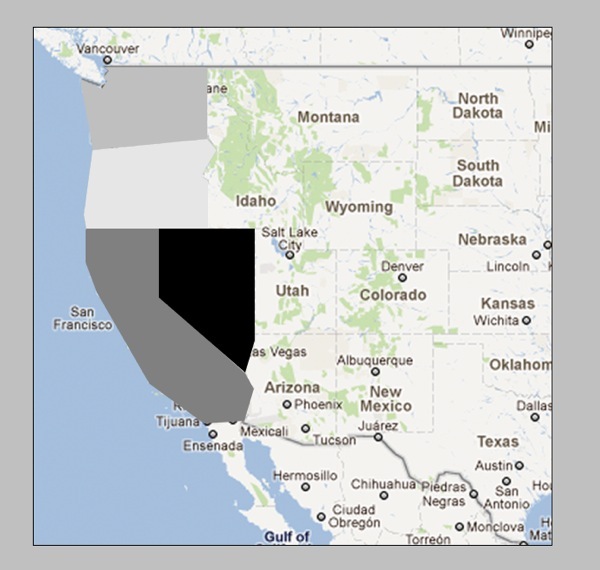 As you contract each shape, you may find that you need to adjust the placement of some of the states. Since you have already drawn all your states, you don’t need to worry about the states lining up perfectly with the map layer anymore. How they relate to each other is more important. I just eyeballed the spacing based on what I thought looked best. 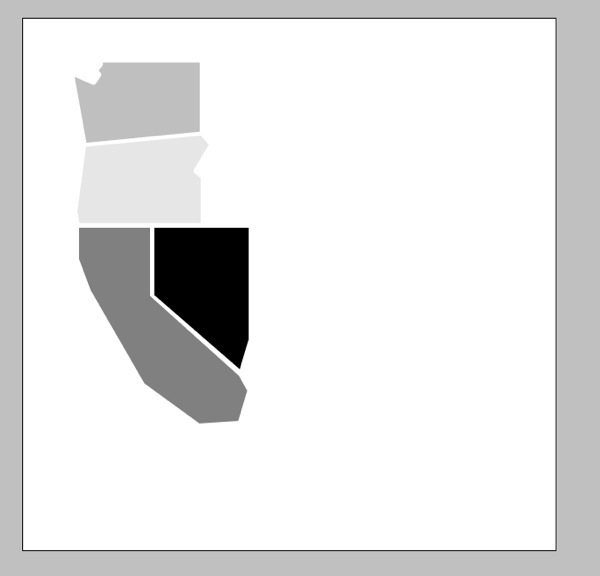 See, we have nice even borders between each of the shapes. Now if you’re wondering why I essentially told you to create each shape twice rather than just contracting the original selection, the answer is because I found it much easier to draw out the shapes when they were all touching. I did try a few different methods for adding space between the shapes but ultimately the Contract & Duplicate gave me the best results. Yes it’s a little tedious this way but once you get into a rhythm it goes pretty quickly. Step 12: Once you’ve got all your shapes drawn and contracted, the final step is use the Polygonal Lasso Tool to draw a shape for your mat layer. The steps are the same as how you originally created each state, just on a bigger scale. And that’s pretty much it! 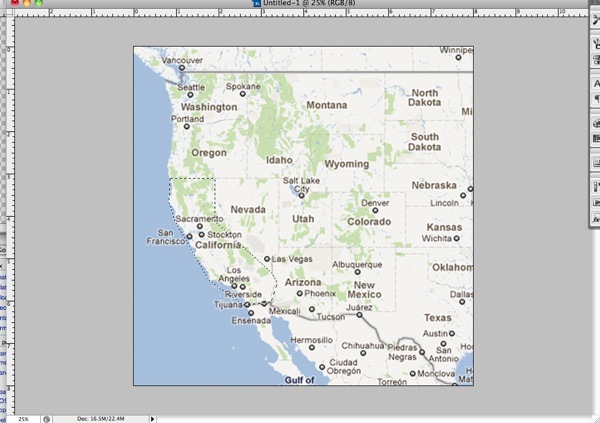 You’ve created your very own map template! Now all you have to do is add in all your photos and papers and elements and you’re good to go. 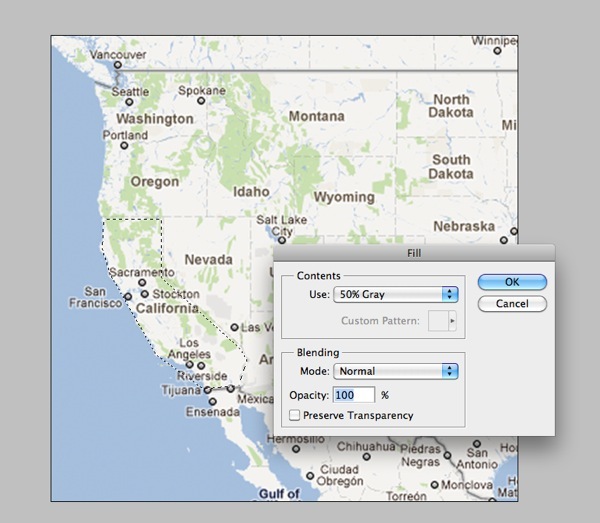 The great thing is this method will work for any map so if you’re not in the US or are wanting to do something more country or even world focused, you can totally follow the steps in this tutorial to create a layout based on any map your heart desires. Which is why I also created a little something extra for all my fellow US-map lovers. And because I was feeling extra generous, I even included all of the Eastern half of the US for you as well. Yes, that’s right I am offering up this awesome template for FREE for personal (non-commercial) use. 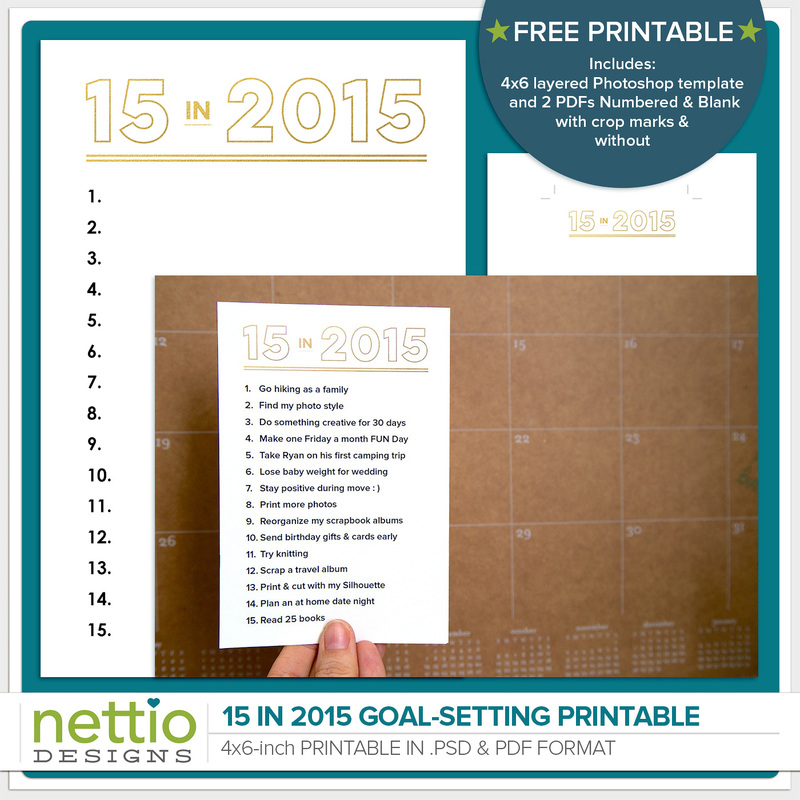 If you’ve never purchased one of my templates before, here’s your chance to see what NettioDesigns is all about. 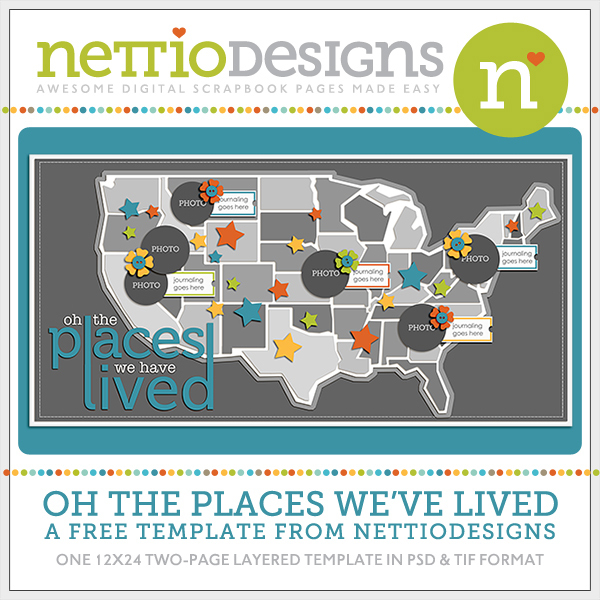 All I ask in return is you spread your love for the template on Twitter/Facebook/forums/blogs and let everyone know they can download it right here at NettioDesigns. Oh and if you post your layout in any gallery, please credit NettioDesigns and where allowed, include a link back to this post. 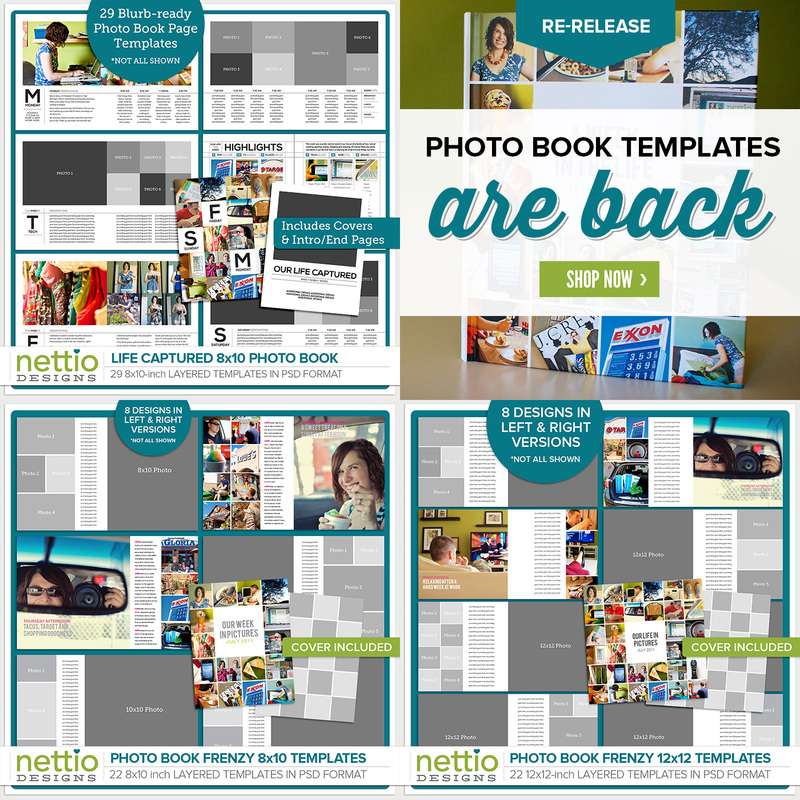 The template is a single 12×24 inch file so if you use the entire template you’ll end up with a two-page layout similar to Kelly’s layout or you can use your crop tool to crop the template to create a single page layout like I did. I can’t wait to see what you create so if you use the template or tutorial, be sure to link me up to your layout!